Commenting on David Cameron’s desire to see greater diversity in our Higher Education institutions, London South Bank University’s (LSBU) Vice-Chancellor, Prof. David Phoenix, has welcomed the move but emphasised the importance of learning from the work already underway on social mobility especially within modern universities. Prof. Phoenix also noted the importance of supporting access for the full range of hard-to-reach groups and the work to help ensure not only access but equality of attainment. "As one of the most diverse universities in the country, LSBU is already leading the way on equality for all current and prospective students," says Prof. Phoenix. "The Prime Minister’s recent proposal that Higher Education institutions will have to publish their admissions data about the gender, class and ethnic background of their students is an excellent step towards breaking down the barriers that minority students face. However, we also need to consider other protected characteristics and work to help access for all hard-to-reach groups, such as white working class males, where attendance continues to fall. If the Prime Minister wishes to reach the challenging targets set for higher education it’s vital that the contribution made by modern universities is fully recognised. "LSBU is committed to the provision of equality for all, valuing diversity across all the dimensions of difference and I’m proud to say, BME and Asian students actually make up nearly as much of our student population as white British students. "We strive to ensure that people from all backgrounds are welcomed, supported and encouraged to study at LSBU and become part of our university community. We recognise that our role is to support people to access education and to provide ongoing support to help ensure equality of attainment once the students are enrolled." 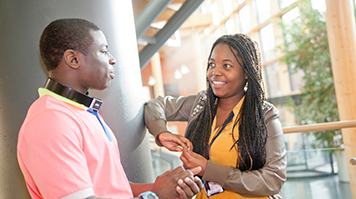 Find out more about equality and diversity at LSBU.